I may have mentioned in an earlier post that my word for the year is “ACTUALIZE”. I wanted something that would inspire me to do the things I really want to do and not procrastinate. Life is short, make the most of it. 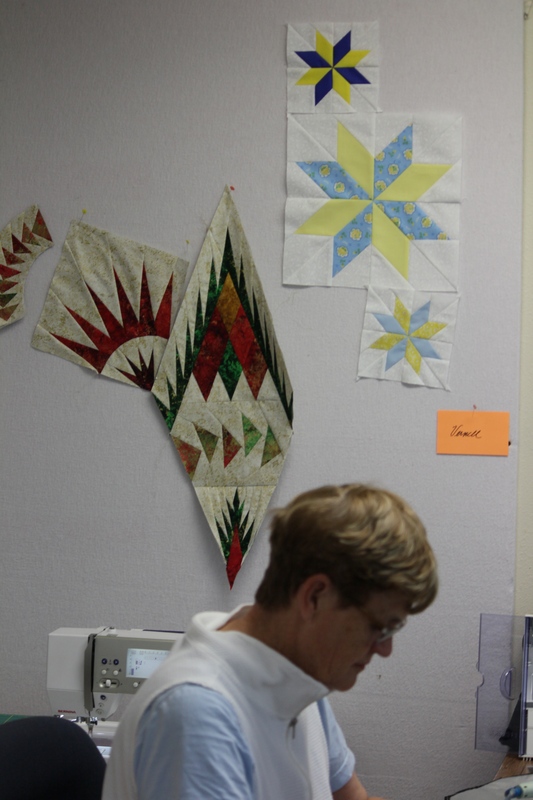 Back in 1995 I started quilting, I think the seed was planted then that I wanted to own a quilt shop and share my new passion with everyone I came in touch with. 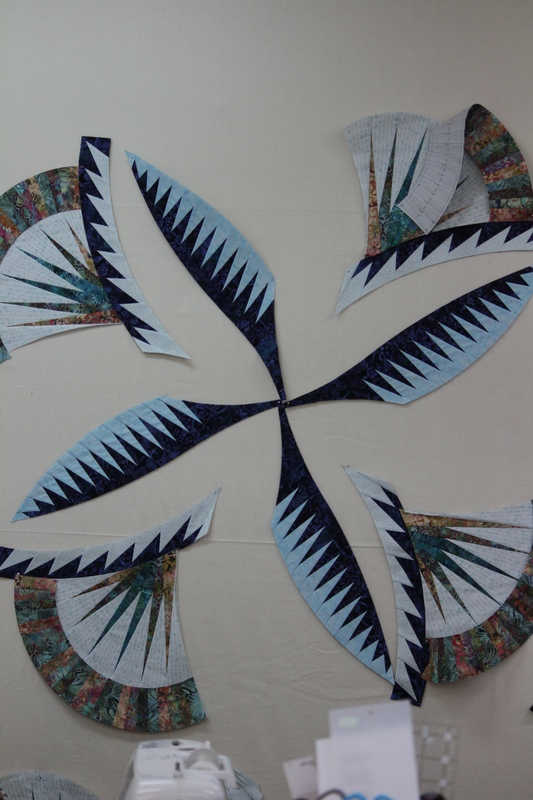 A few years later while taking a workshop from Mary Lou Weidman she asked each of us what our favorite part of quilting was; I replied sharing what I know with other quilters. 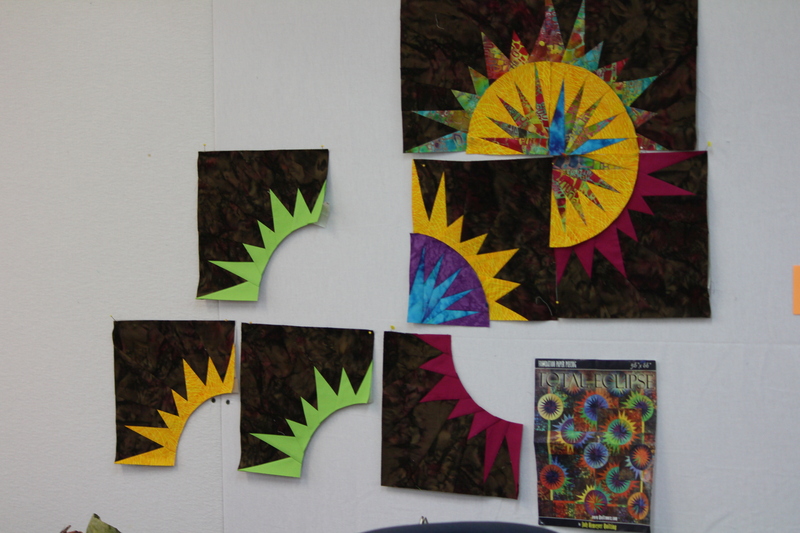 Time Warp to 2011 I became a certified instructor for Judy Niemeyer Quilting aka Quiltworx and I have had a blast. Traveling around Texas and even outside of Texas to teach and vend at shows has been so much fun; but I want to be more productive in my own community. As you recall in 2014 we made the BIG move to the SMALL town of Luling, TX. There is just something about this town that calls upon me to make an impact! 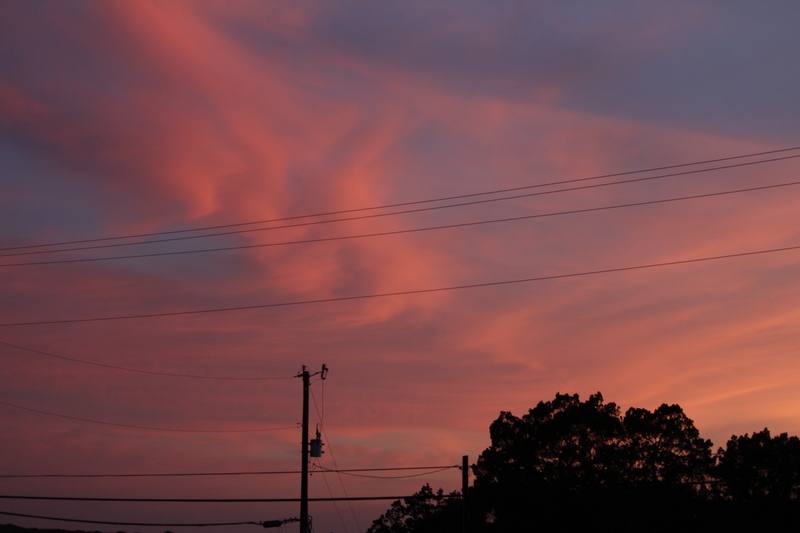 While we are not residents of Luling; we live just past the county line; I consider Luling my new hometown! So begins the next chapter, and I am so excited about it! I have found a perfect little building right on the main drag. The owners have just completed a fabulous renovation and I must say it is full of charm and excitement. I can’t wait to share the inside with you – but for now you will have to whet your appetite with a few photos of the outside and the town. For you to really appreciate the work that has been done I will start with a before photo from google. The building, original brick, new awning, new doors and windows. Looking forward to seeing what my sign bidders come up with! This one can be found at the Luling Oil Museum, however, there are many around town and that have been “decorated” and you can take a self-guided tour! The Luling Oil Museum is a great place to learn more about the history of our town. Stay tuned as I will be sharing photos from the inside soon. 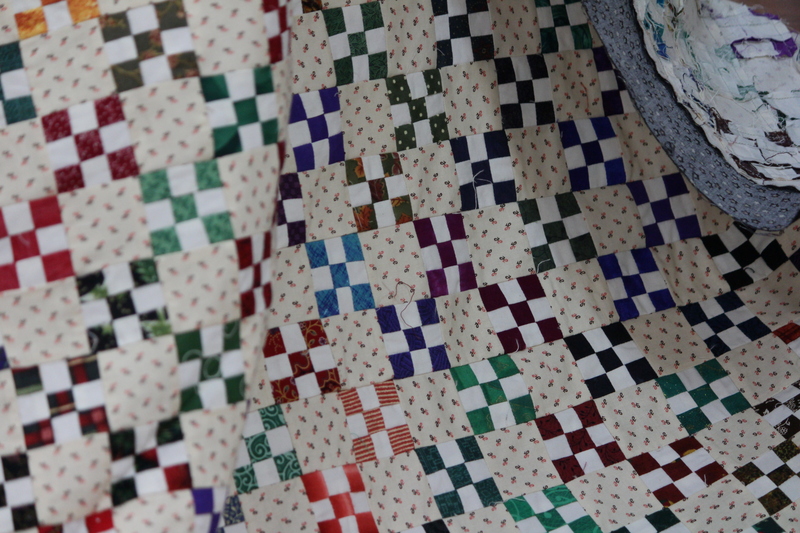 You will also get a sneak peek at the fabrics that will be lining our shelves! 2015 was a busy year for us. We had just moved into our new home. In the studio we had shelving to build, peg board to hang, cabinetry to place. Lots of rearranging as I decided to tweak things, 256 sf of design walls to put up. 48 Retreat/Quilt To You Wilt/Cruise days, most of these where a taught, but a couple where I was a lucky participant! 6 visits to guilds to provide lectures and workshops! 22 workshop days at various shops usually involving 2 or more hours of travel each way! 6 shows including NQA in Little Rock. 1 Guest Artist appearance at a show where I was a vendor had a special exhibit and daily bed-turnings. 4 days of Farm Camp for the Grandkids, 7 days of Camp Dee-Dee with the Grandkids! Enjoyed 2 plays that my granddaughter was in, baseball games for the grandson as well as other family time events! Here are most of the finishes for 2015…. The original “One” was my first finish of 2015. 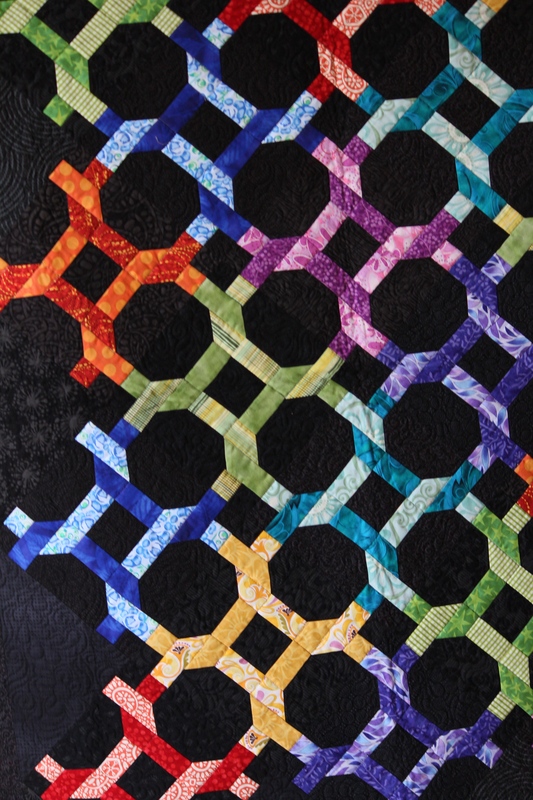 Be sure to look at the close-up photo of the beading a fellow quilter added for me! My 2nd “One” of the year! I have another one that just needs the leaf stitched down! 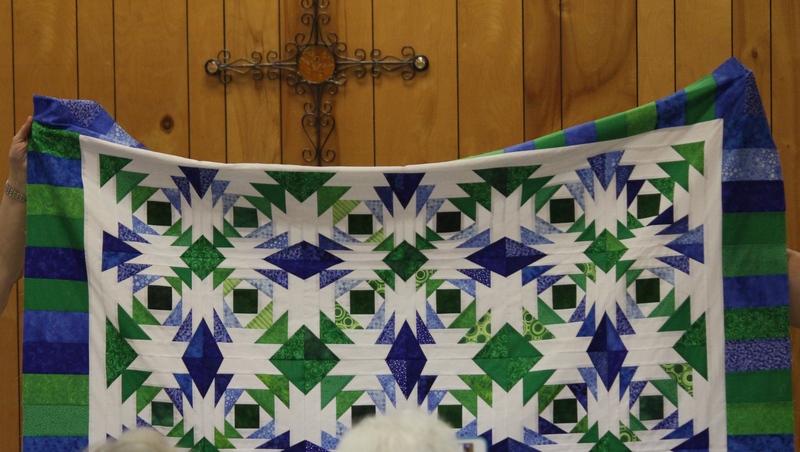 I look forward to teaching this quilt again and again! It is fun! Paradise in Blooms, started, finished, quilted and bound in 2015! WooHoo! 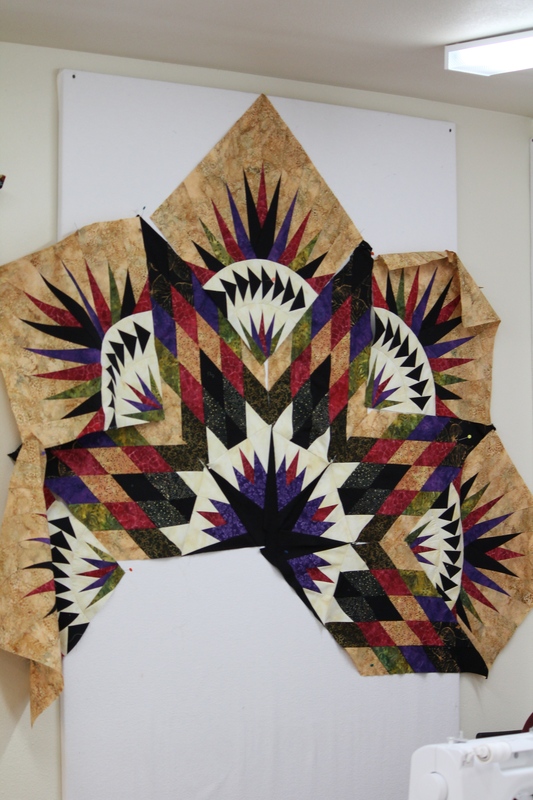 A beauty that was started this year – but I may need to go visit my friend Lisa at Compass Point Quilts in NH to finish it! Tea Time Placemats. I love making these leaf quilts. I have kits and patterns available at my online store. Vintage Compass – made as a sample for Pinwheels and Posies in Dickinson, TX. They have kits! My 2nd Prismatic Star of the year. I cannot get enough of this quilt! It is so quick and easy to make. Kits and pattern available at my online store. 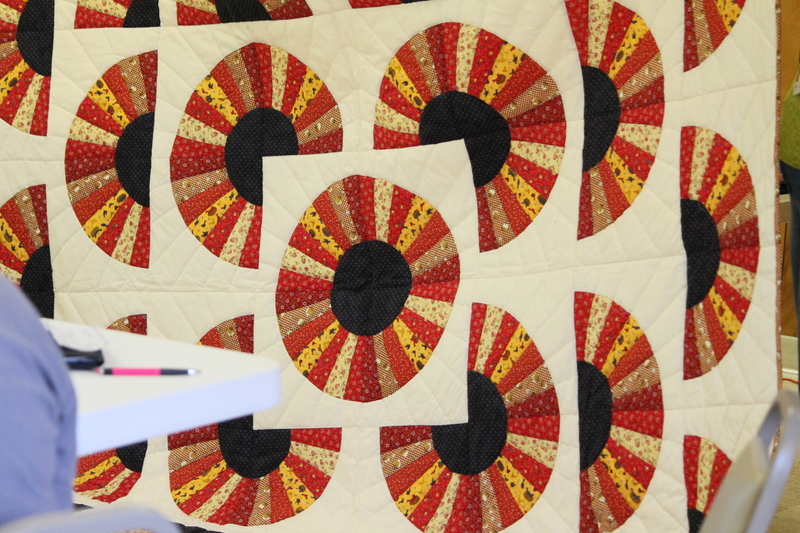 Paddlewheel using Judy and Judel Niemeyers fabric collection, Reclaimed West. Pattern is still available at my online store. 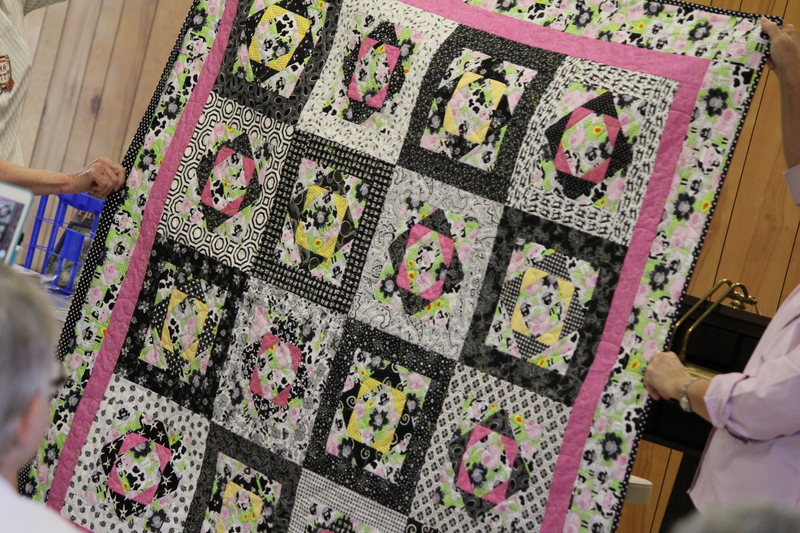 All fabrics were donated by Timeless Treasures and I did a 2 part blog tutorial for how I made this quilt. See part 1 here. Landscape table runner made and kitted for the cruise I taught on in May. 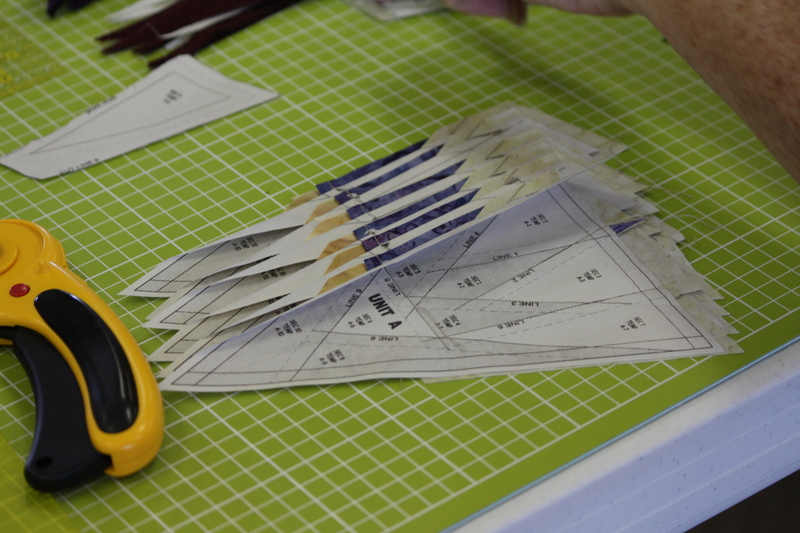 All kits are pre-cut ready to sew! Including the papers for one table runner. 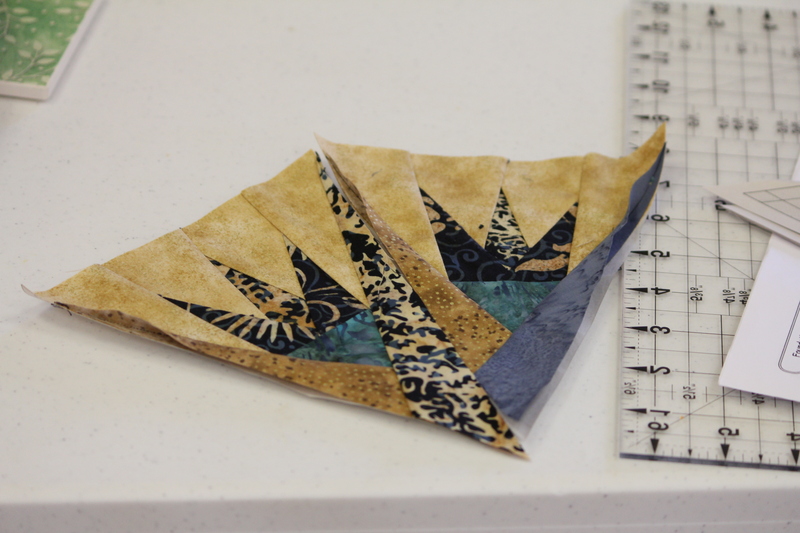 Kit includes papers to make 3 more quilts, they just aren’t precut! 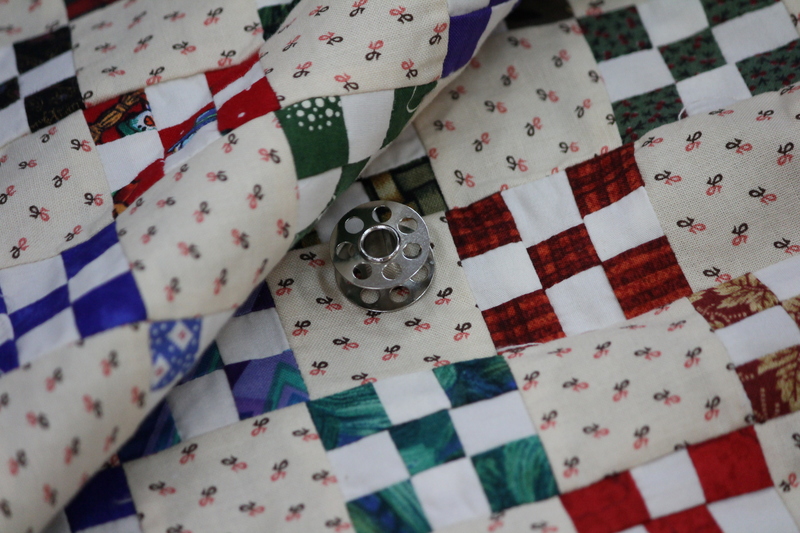 I have included a photo of the back of this quilt so you can see my “upside down” quilting! The back of my Landscapes Table Runner so you can see the quilting. This backing fabric was approx 24″ wide, purchased on Maui in 2001, just waiting for the perfect quilt. A small sample made to show the fabrics in kits I have available when teaching Seasonal Table Runner/Table Topper. 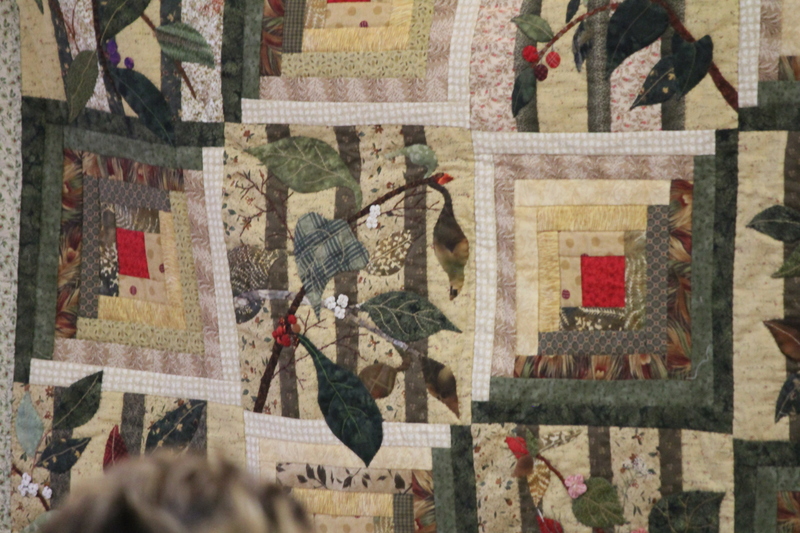 This quilt is at Hancocks of Paducah right now so I am using the new coversheet for the photo. 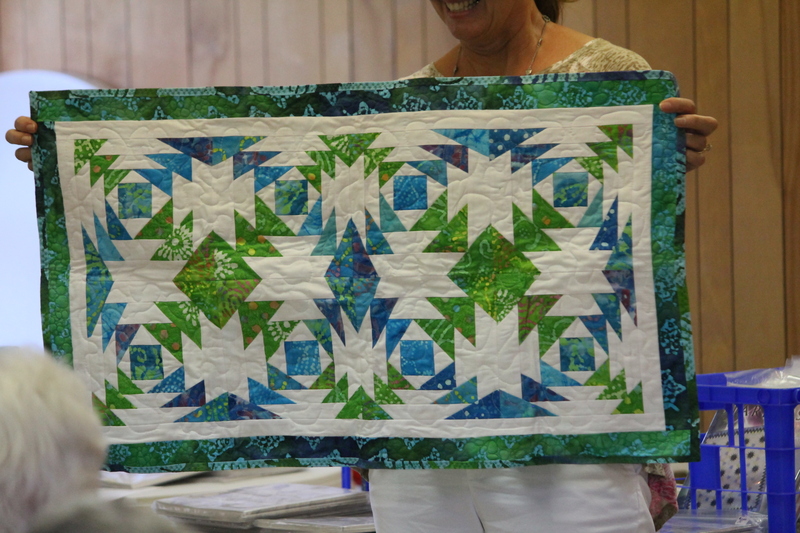 I made this quilt for Quiltworx, while I was there in July. Constellation is from the book Geese Migrations; available on my site! Vintage Compass made for Certified Shop Pinwheels and Posies. Kits available from them! Osprey’s Nest, downsized. OK I got really tired of making geese – so I figured out what I could make with all those fabulous log cabin blocks and the geese I had done. So far 1 table topper, 1 table runner and 2 placemats. 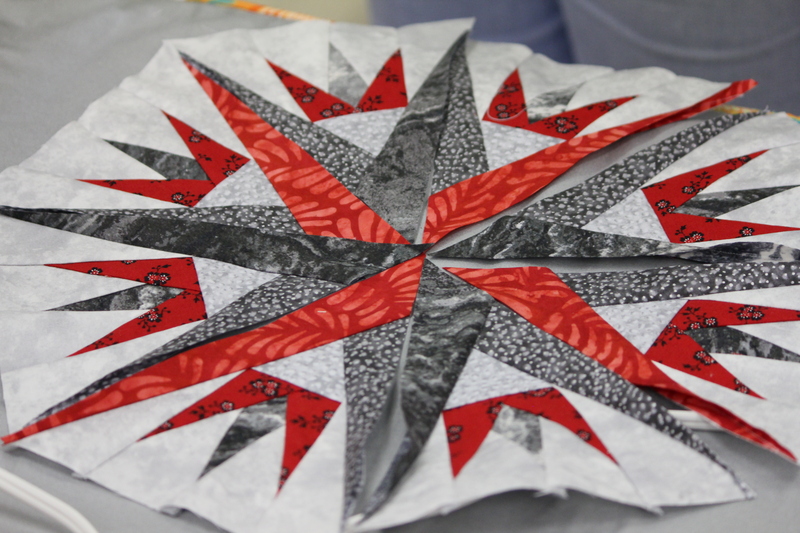 I will also have the mirror image of the table topper when I am done! Pattern available on the site! Dancing in the Moonlight! A silhouette of my granddaughter from a photo where she was dancing at camp in 2014. A friend took the tiny photo and made it life size for me. The blocks in the background are Garden Wall and available on the site. I used an ombre for my backgrounds and a Judy Niemeyer Bali pre-sorted Pops set for the accents. 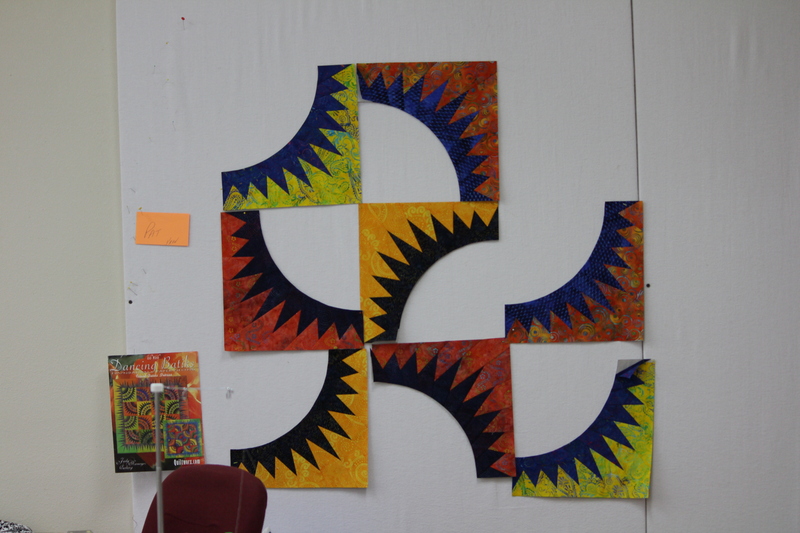 Some of the piecing for this quilt was started many moons (aka years) ago. AndSewItBegan asked me to come teach this at her retreat house so I figured I better get it together. I used a Kaufman Khaki for the background and hand-dyes for the accent fabrics. This pattern is Southern Beauty aka Sleeping Beauty by Sue Garman. Don’t you love Sue’s work? 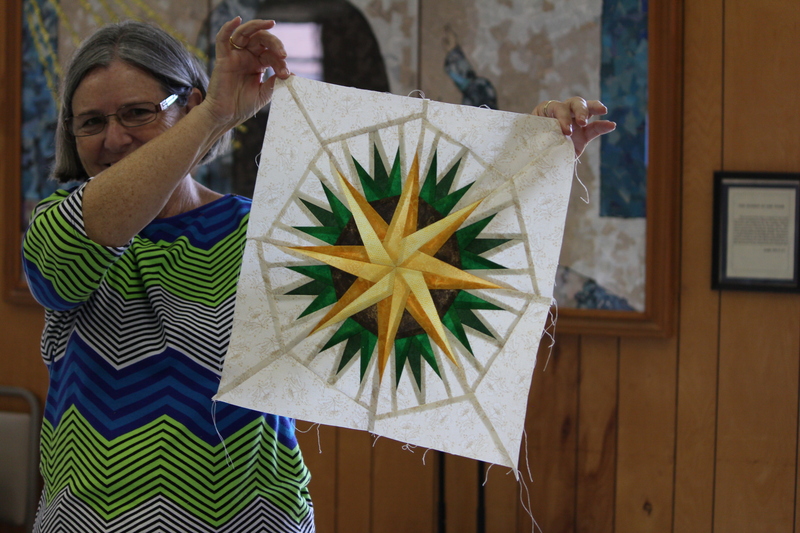 This year I joined the Luling Fiber Arts group and our leader, Kelly, taught us how to make this fun convergence quilt. This quilt is small but was made in 2 hours, including all cutting! 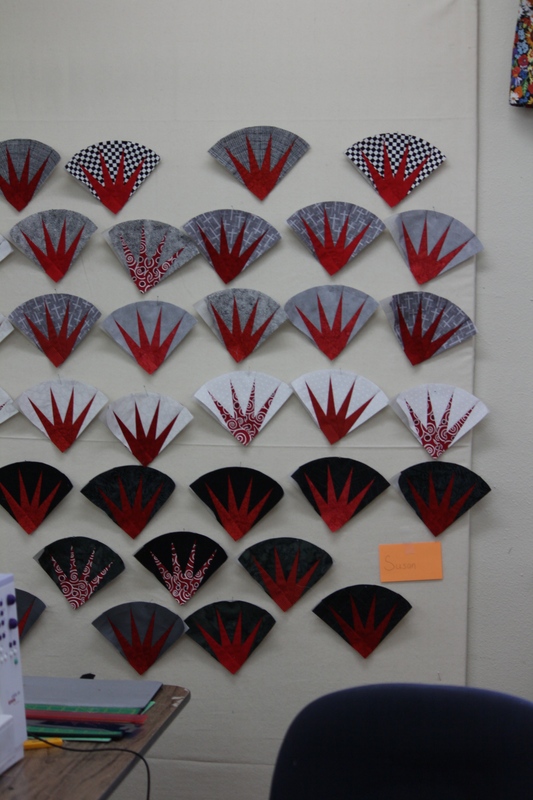 Those are all silks on the wall, my WoodCarvers star is in progress! Any bets on a finish date? Pattern uses the new lone star technique and is available on the site! I cannot take all the credit for this one. 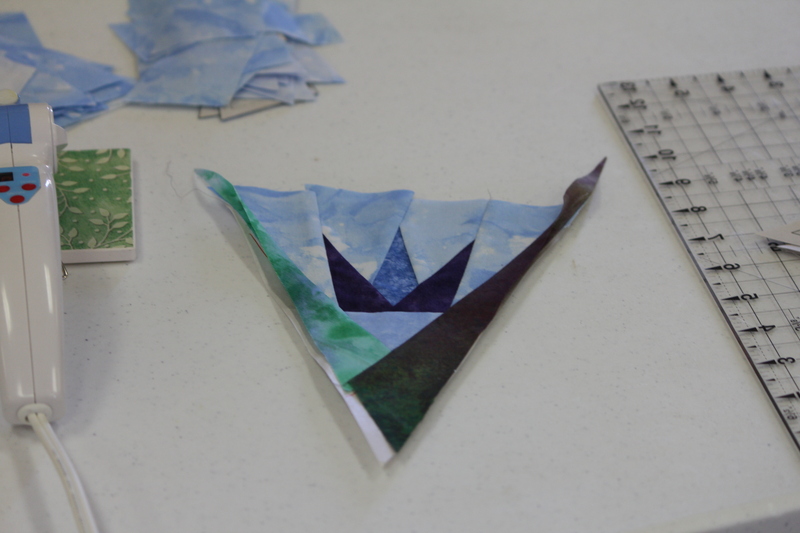 Most of the paper-piecing was done while in Montana, but not by me. My 3 Australian friends did not bring enough of their own projects so they worked on mine! 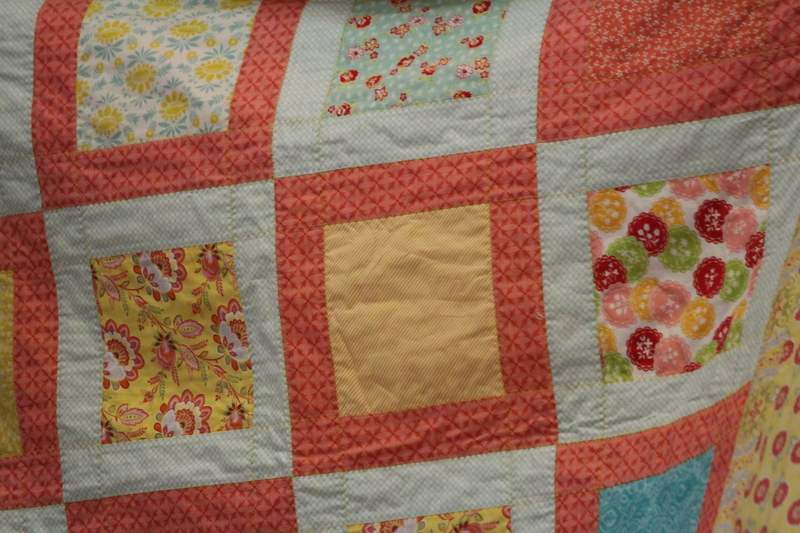 This quilt is called Chasing Rainbows and can be found in the Geese Migrations Book (available on this site). I used 2 different ombre fabrics for the color and black batik. I hope to have kits for this quilt very soon. These 4 quilts were completed by me to be donated to our local first responders! They will be quilted very soon! My version of Prairie Pinwheels. This quilt was fun and easy to make and I was able to use all stash fabrics! What a great quilt for a young child! Pattern available at my online store. Not finished but wanted to include it. I need to piece and add the borders. This pattern is called Indian Summer and is available at my online store. 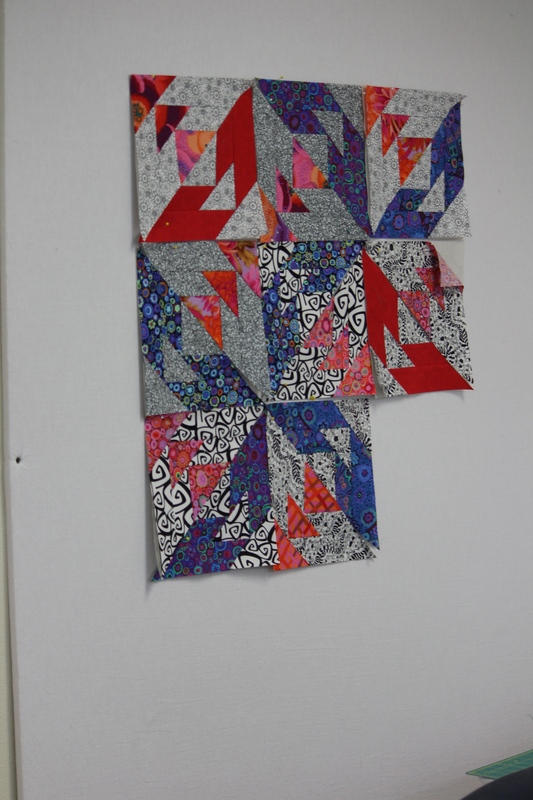 This sample is made with lots of Kaffe Fassett fabrics and black/whites. All purchased at Pinwheels and Posies Quilt Shop. Diamond Wedding Ring NEW version! I made the original version many many years ago and let me tell you it was not for the faint of heart. There were at least 8 billion Y seams! 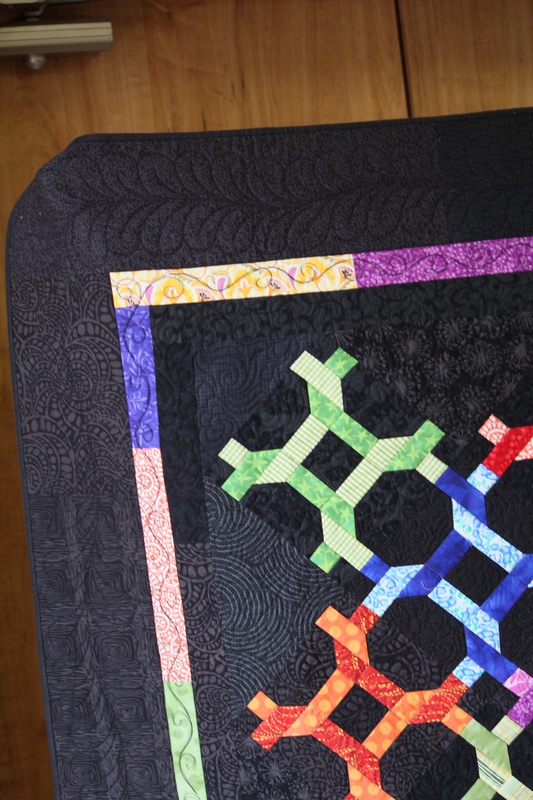 This quilt is assembled with ZERO Y seams. 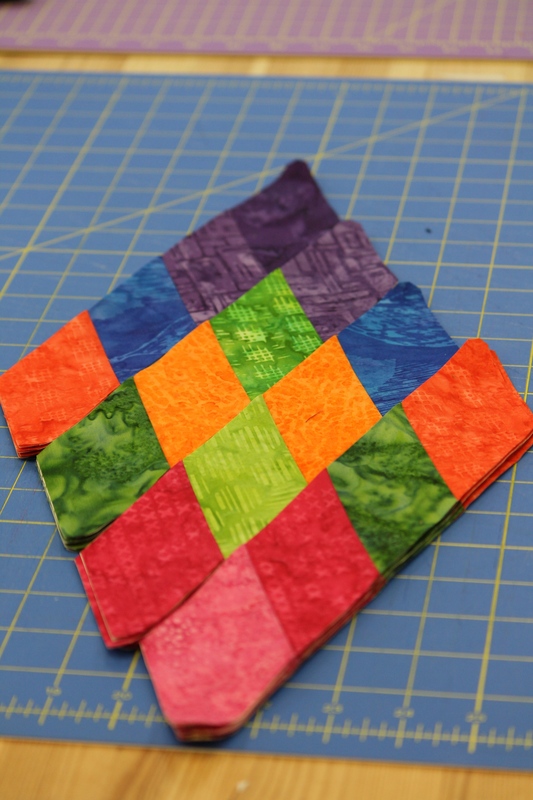 Quick and easy paper-piecing and custom creative grids rulers make this quilt a snap! 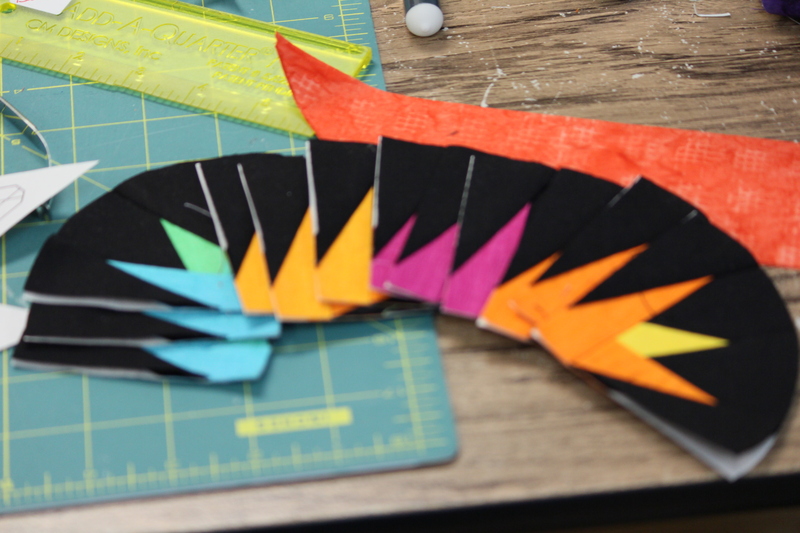 Rulers and patterns available in the store! All fabrics (except the outer border) were purchased in June 2015 from Valli and Kim in Dripping Springs, TX. The background has all kinds of appropriate sayings for a couple in love! Fractured Paint Box – she’s a little loud but was so fun to make. The center is made from a very dark green accent and Kaufman solids strip set. The border was left over backing from a wedding quilt I made a couple of years ago; purchased in Maui when we attended the wedding! I love destination weddings – how about you? I have ended the year with “Three” I started this on Christmas Day, it went very quickly. Kits will be available on my site soon! This one is called Lemons, Limes and Satsumas; we had those 3 trees in our backyard before we moved. Picking fresh fruit around Christmas each year and burying your nose in the fabulous blossoms each spring. I miss those trees! Let’s all make 2016 fabulous! My dad died when I was only 7 so my memories are short, but sweet. Through the years I have pieced together some family history and I am honoring my father with a post today. He would’ve been 109 years old today! He was 57 when I was born and I was his first born. A little piece of history on my father – his first wife was the niece of Butch Cassidy and they were married in Butch Cassidy’s fathers home. They never had children. Born in Midway, UT to David Edwin Bunnell and Estelle Peters Bunnell, he was the first born of 10 children. My father was named Ferry E Bunnell, my mom did not know what the E stood for, but I have learned it was for Edwin, after his father. Where the Ferry came from, I do not know. I can tell you he went by Larry. Stories from my mom tell me that on his 16th birthday he went to work in the mines in Park City, UT. Someday I hope to verify some of this. He worked odd jobs through out his job and supported our family as a dishwasher at the Denny’s in Elko, NV at one point. He died on August 4, 1970, just 4 days before my younger sister’s 4th birthday. She knew even less of our father due to lengthy stays at Shriners Hospital when she was young. Growing up I knew my Uncle Bill Bunnell and his wife, June. I also was acquainted with my Aunt June Bunnell Walker when I was young. Imagine my surprise when I started working on my family history and found there had been many more aunts and uncles out there! In 2010 I was able to meet my Aunt Hazel and my Aunt Darlene, both have passed now. My meeting them is a life treasure! I have also met a few cousins through my research, this is quite fun! I love that Facebook in particular helps me to keep up with a few Bunnell Family happenings. I have also found Curtis and Fornia cousins out there as well, but that is story for another day! Here are a few photos with the simple stories I know. Bunnell Family Crest. Someday I may learn what each symbol signifies…. This is a photo of my dad! Precious! Given to me by Bill and June Bunnell! My dad! This photo survived the many moves of my childhood. My dad and his new sister, Iva. Canada 1911. My first Christmas; Elko, NV at my mom’s best friends home; Dorothy Chase. I am named after her son Dennis! At my grandfather, David Edwin Bunnell’s funeral. See the little tyke in the upper right corner! That is ME, my dad is holding me and my mom is next to him. Are you in this photo? Or your parents? The Bunnell Siblings at the funeral of their father; David Edwin Bunnell. My dad is on the far left – please help identify the other family members and I will update! The Bunnell Boys at their fathers funeral! My dad on the far left. Aunt Hazel 97 years young! She was amazing. She lived in AZ and had been a widow for many many years. She had chosen the particular apartment at her facility because it was close to the swimming pool When we visited in November of 2010 she stated that she was only swimming once a day because it was a little chilly this time of year! Here we are looking at my computer probably photos of my grandkids! 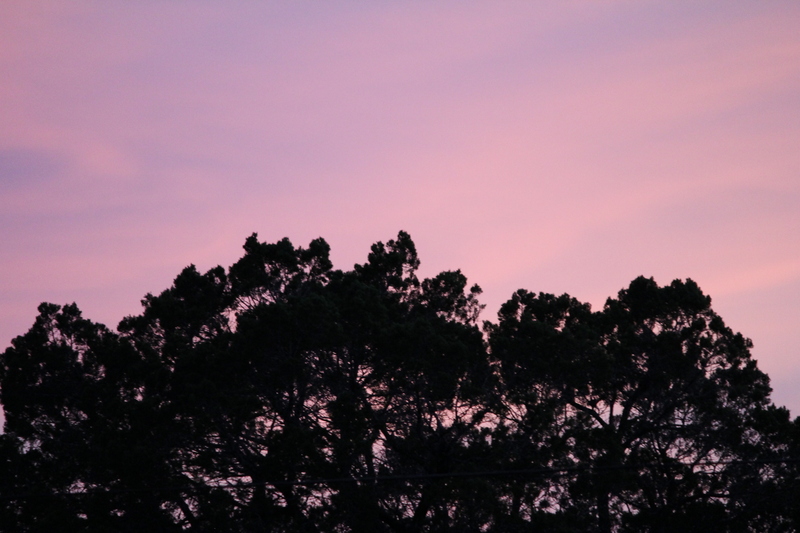 My cousin Yvonne – she is a photographer and takes amazing photos! However she did not take this one! I wish we lived closer because I am sure we could get into mischief together! Her father was my dad’s brother Bert! Aunt Darlene, who I also met on my whirlwind trip in November 2010. Another treasured photo as she is no longer with us either! Yvonne rescued our family history when my dad’s aunt Iva passed. Her husband Hank scanned each documented and then produced cd’s for each family that wanted one. A Bunnell family home in New Jersey. The Bunnell Church in Bonneuil, France. May you blessed this Christmas season and surrounded by those that bring you joy! You’ve been asking for it and here it finally is! A tutorial for how I like to appliqué vines and similar quilt elements. I am using the pattern “One” by Quiltworx for my example. The first thing you need to do is determine how wide you want your vein. I have 2 samples here. Captains Wheel is the first one, it has a very thin “rope”. The next is ONE and I used a wider cut strip for this one. 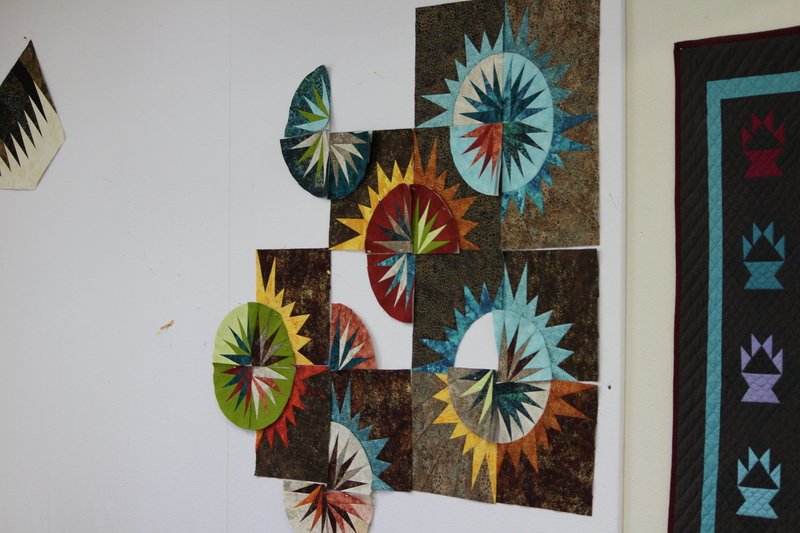 I make a sample out of scrap fabric and just do the steps to see what I will like. Be sure to use contrasting fabrics for your sample. Do NOT trim before ironing! In this sample I did trim before ironing – OOPS! In this photo I trimmed the end before I ironed – DO NOT DO THIS! IRON FIRST! See what happened, after I pressed? The angle is wrong! Now I have 2 options, I can take the whole thing off and restitch — or – I can just trim the end of the leaf a little bit? What do you think I did? 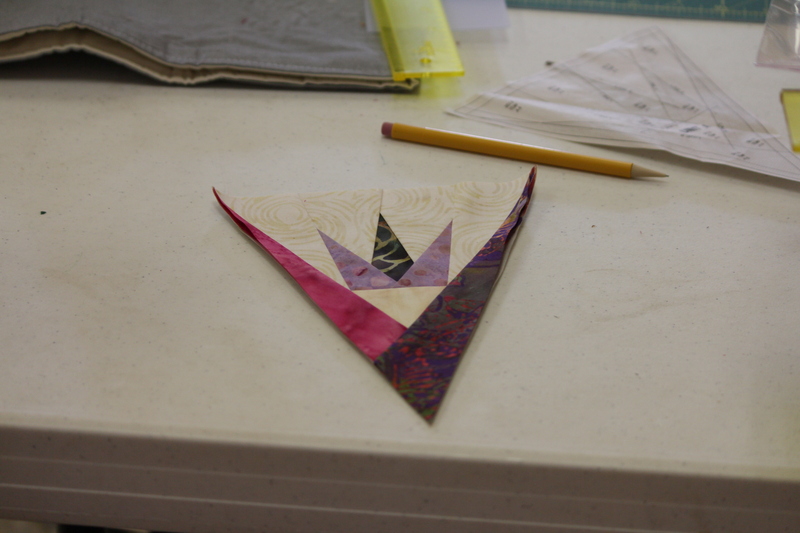 Now place the second side, leave each end a little long so you can fold it over for a nice finish. If you are comparing my sample to the pattern you will notice I switched sides for the long/short edges. It’s your quilt! PRESS – this is the top of the leaf. See how much length I left? The stem at the bottom of the leaf after I have folded the end for a nice finish. I did take this back to machine and finish stitching to the end at the top and bottom. I hope you find this tutorial helpful. I plan to do a few more so if you have any gentle critiques please post them in the comments. Remember I am available to teach at your local quilt shop or your quilt guild. You can find my schedule here. We will never forget the day our world changed. I worked for a boating company in Seabrook, TX, MarineMax. I had just left one location and was getting ready to head back to my office, my sister had not been feeling well over the weekend and I called to see how she was feeling. Phil answered the phone and said he was watching the news as a plane had just hit a building in NY – at that time he thought it might’ve been a commuter plane, while we were chatting the 2nd plane attacked and I knew, as did the rest of the world, America was a target. 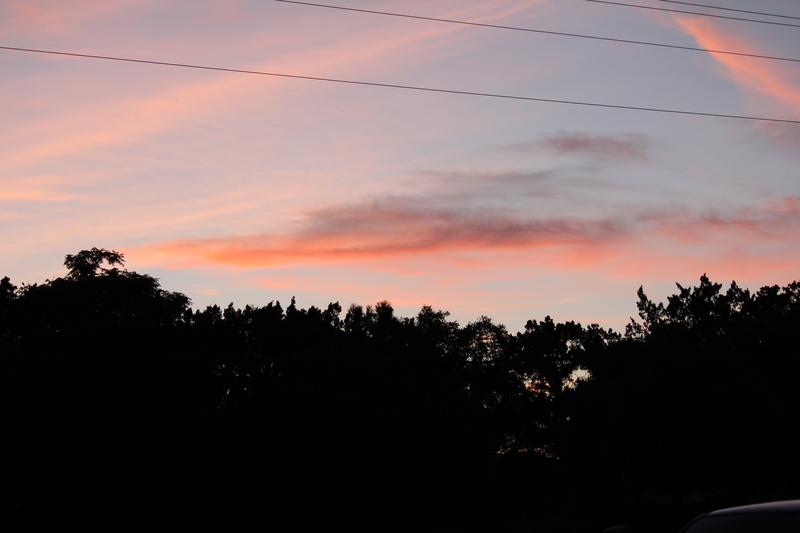 I hung up the phone, called my husband who had not heard yet. Then headed to my office, a co-worker and I headed to my house to pick up a tv to be able to watch the news. Some co-workers headed home, some stayed it was their choice. I did not want to go home to an empty house so I stayed and we tried to make sense of a senseless act. I watch our news today and we have too many senseless acts, they are not as dramatic as the attacks in NY on 9/11/2001 but they all add up to a great loss of life. Horrible acts of violence are happening everyday all around the world and too often in our own cities and neighborhoods. I do not know the answers but I feel the great sadness! 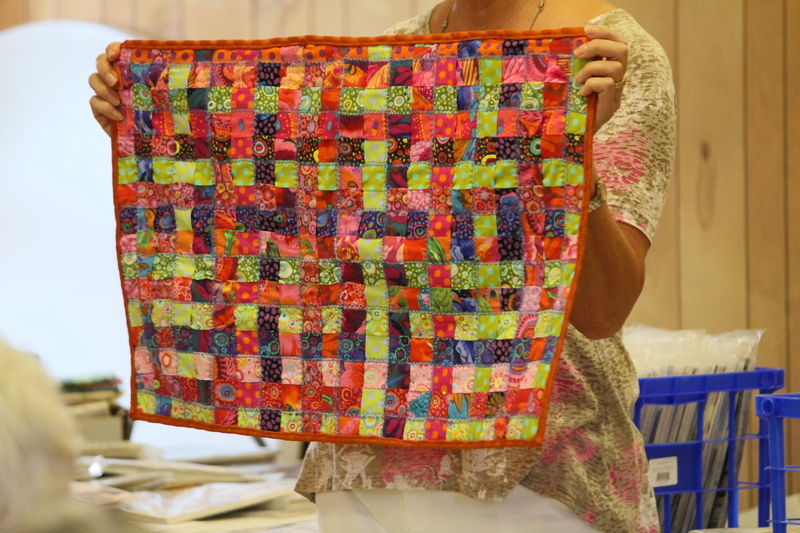 In 2010 I was contacted by someone to see if I could quilt 3 quilts for her. She lives over 50 miles away but she wanted to come show me the quilts and talk to me about them. We had a consultation and I gave her my ideas for quilting them and a quote to quilt all 3. 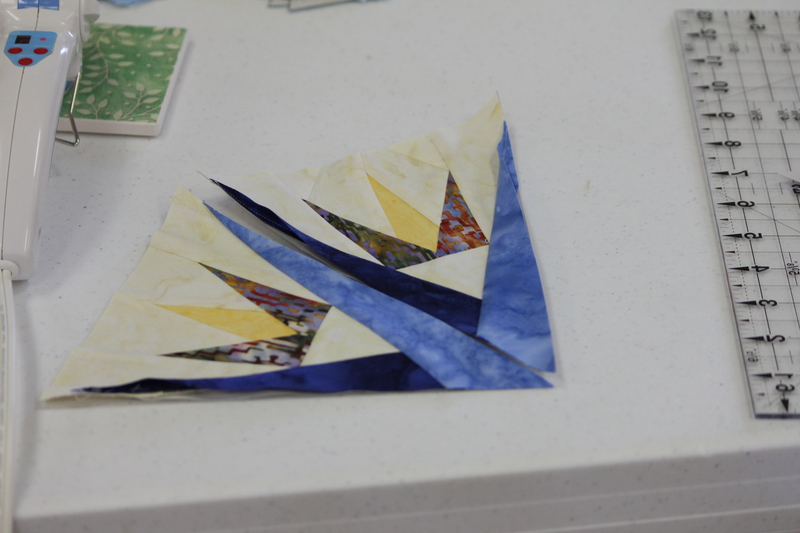 She took them back home to piece the backings together and decide on some quilting options I have given her. The 3 quilts are almost identical, 1 is for her, and 1 each for her 2 sons, 11 and 14. She brought the quilts back to me and I put them in the schedule for January. These quilts were quite large 102×102 and like I said very similar. I knew once I started quilting them I would be challenged to keep working on them because I enjoy variety! I quilted the boys quilts back to back but had to wait to get more batting for mom’s quilt. During this time she called to ask if I could quilt the boys names into their quilts. I explained that these quilts were completed, but I offered to create machine embroidered labels for her quilts. She sent me an email with correct spelling and the information she wanted on the quilts. And then these quilts took on new meaning for me. Her sons were very very young on that day in our history and she wanted them to always remember and this was her way to honor that horrific event in our history. I was touched to be part of her gift to her sons. 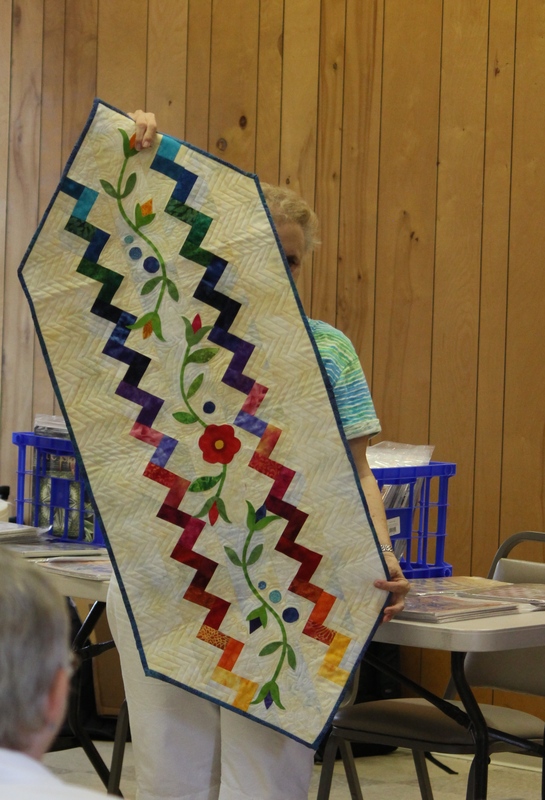 A couple of weeks ago I was the guest speaker for the Victoria Area Quilt Guild! They are a very busy guild! And so many nice ladies! It was great to see all the familiar faces in the group too – many of these ladies had been on the Quilting Cruise earlier this year! They meet on the 4th Thursday of the month – you can learn more about them here. To view their photos from show and tell and/or my trunk show. Here are a few of the show and tells from their guild meeting! A smaller option from the same workshop. Love the arrangement on this one…. 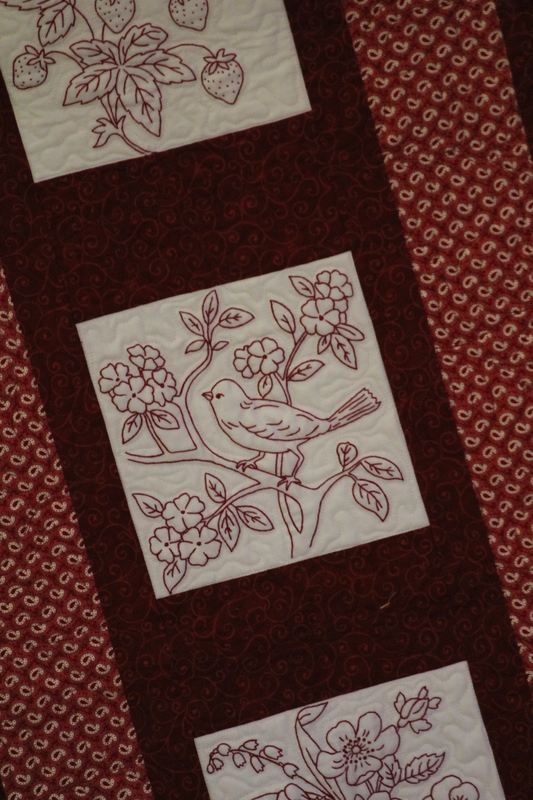 This redwork was done by one guild member and another guild member made the quilt. Exquisite needle work on the redwork. A great setting for those prints that scream to be seen. 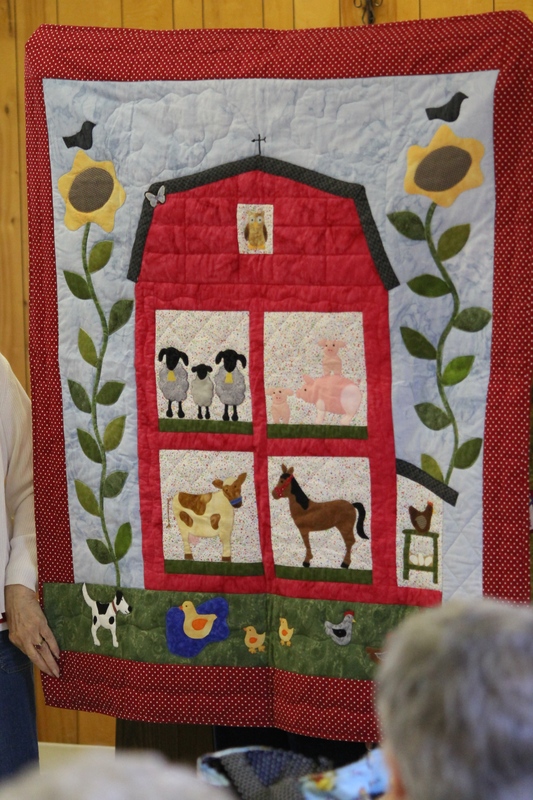 And this adorable barn quilt for a young child – when I grow up I want to needle turn like that! Love how the block ending! This Show and Tell is our CRUISE QUILT!!! Quilted and Bound with Applique! After the meeting and a quick bite to eat we started our workshop. Compass Rose Table Runner! 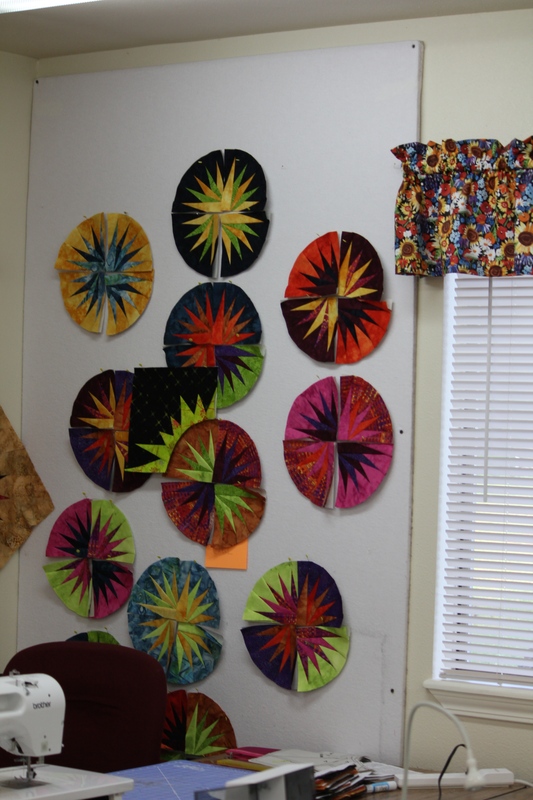 This is a great pattern and the there are enough papers included in the pattern to make 2 table runners. This block is also the center for Mariner’s Compass (retreat in October). It is also a featured block in Captain’s Wheel. Lined up and ready to SEW!!! 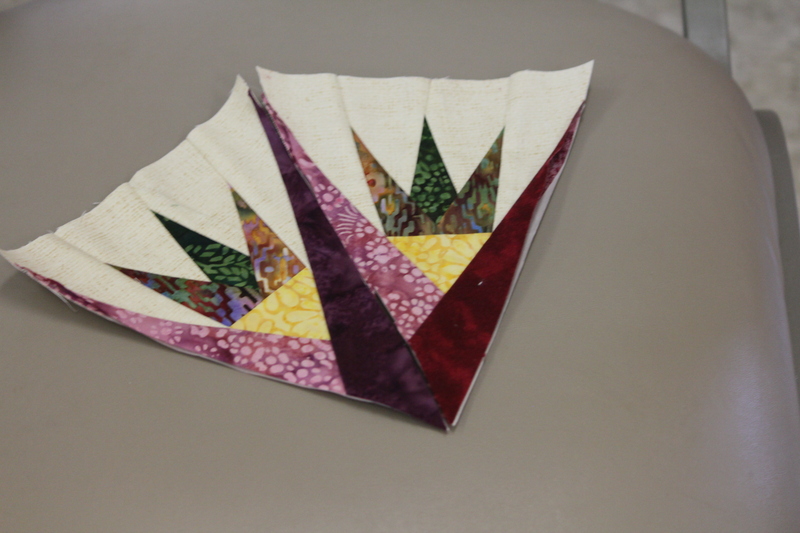 Thank You Quilt Guild of Greater Victoria! I had a wonderful time!